ToTehMoon: The Devil and our Friends - We Win!!! On this Good Friday, I had a bit of an unusual situation to come up. I got the day off from work. However, due to snow days, the teacher workday scheduled for today became a make-up day, so the kids are in school. And, my wife ended up subbing today. So, I'm on my own for a bit today - at least until school let's out. Decided to use the morning for a little scouting work for a MINI drive idea I have in my head. I suppose it is building upon the Howl at the Moon run I did last fall. But this time, with haunted locations! The first step was to identify some haunted locations that might be fun to get to (i.e. there are twisty roads leading there). Not the easiest task. I've identified four potential locations that are generally in the area. There are lots more in the Triad/Triangle areas, but who wants to visit a college dorm? Of course, the first candidate I visited today was close to that - Gimghoul Castle in Chapel Hill. I vaguely remembering visiting the castle either during high school or college with some friends. And yes, today's mission meant riding through campus in the MINI WUF to get there. No evidence of parties from last night's NIT appearance. No students at all really - guess class was out. Anyway, there is a gravel circle that looks like it might be open to the public so we could circle right by the castle. Not sure if it just happened to be open today or not. If not, we should be able to get close enough on the surface street to be a worthwhile stop. From there, I headed southwest for some country roads. This took me through downtown Pittsboro, where I got to see the recently burned down Chatham County Courthouse when I went through the traffic circle. 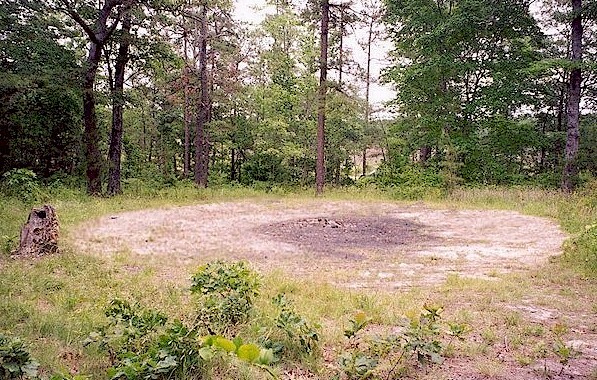 The next target was in the country - the Devil's Tramping Ground. I remember hearing the tale of the DTG growing up. In my research, I had found a blog post that provided some GPS coordinates. Upon arriving there, I was presented with a dirt road leading down into some woods. Definitely not MINI country judging by the "lake" that had formed in a dip in the path. But, it was also heavily marked with No Trespassing signs. Just judging by sight, it didn't look like the right place. However, about 2/10ths of a mile back up the road was a small pull off with a path that led to a small circular-ish area littered with the remnants of partiers. This looked much more like the photos I have found on-line describing the DTG. Right in the middle were the remains of a fire. Today, laying on top, were some "things" - sorry, no idea what they might be - that looked to be made out of some kind of hair (maybe some horse mane hair?). Maybe 16 inches long, mostly white with some black, and they had some kind of handles at one end. Whoever had been using them for whatever had thrown them on the remains of the logs, but they had not burned up. This may be do-able. Not great parking and who knows what kind of crowd we might stumble upon if I ever do this. So those were the two locations I visited this morning. fwiw, I may also look at throwing in the Pisgah Covered Bridge (found a tale about the apparition of a hanged woman that appears in the bridge), Lydia's Bridge (great story in the vanishing hitchhiker vein), and/or the Cabe's Land Cemetary. All of those would probably be too long for one drive. Hmm - a series of haunted MINI runs? With all that said, what is this bit about our Friends in the title of this post? After visiting the DTG, I had plotted a route up through Siler City and then some back roads of Alamance County to get back home. 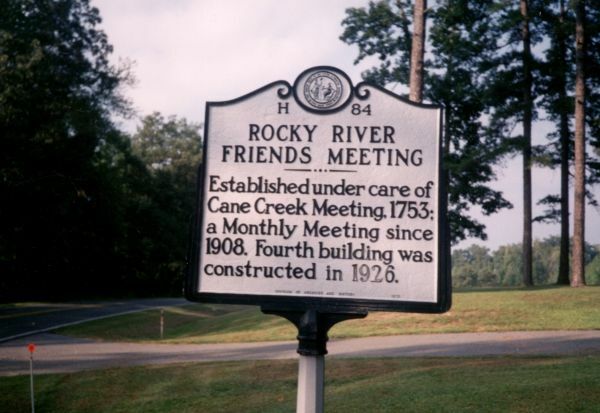 I didn't even realize it, but it took me right by the Rocky River Friends Meeting. That was notable as just last weekend they were having a revival at the meeting. I didn't get down to it, but it had been in our bulletin at church. It was a nice large facility with lots of playground equipment (a good sign). I guess looks can be deceiving, but it appeared to be a nice vibrant church. And, it has been around since 1753 - so long, it has its own historical marker. This means that in my journey I got to contrast the DTG with the Rocky River Friends Meeting. The first is a patch of dirt off the side of a country road that has been overtaken by partygoers and is largely unimpressive. But the Friends Meeting is alive and well - no trouble finding it and no threat for now of it fading from memory or existence. So, imo, the Friends are winning!! !